Today’s Gospel shows us two expectant mothers rejoicing together. 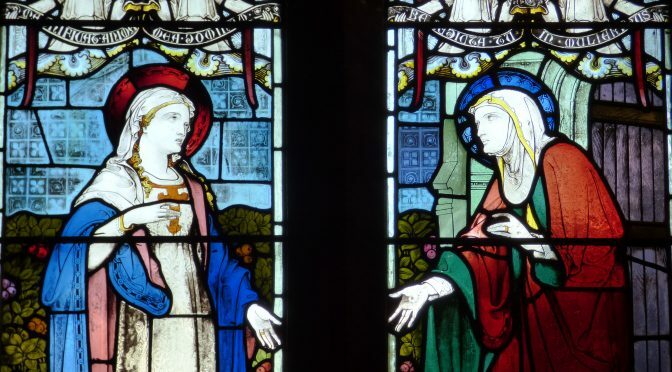 Mary is a young woman, not yet married; Elizabeth is older, and she thought that her time for bearing a child had gone. Each has become a mother through God’s miraculous intervention, and they celebrate. John the Baptist, in his mother’s womb, shares in the rejoicing, leaping for joy at the presence of the unborn Jesus. Elizabeth and Mary are faithful daughters of Israel, and they rejoice at God’s fulfilment of his promises to his people. Mary is carrying the Saviour in her womb, Elizabeth the great prophet who will announce his coming. Each of these women will faithfully play her part in God’s plan of salvation. Sadness, too, lies ahead for both mothers. As Simeon prophesies, ‘a sword will pierce the heart’ of Mary, and Elizabeth will also see her son’s life cut short. Their faith will be tested. But at this moment, they can rejoice. Even before their children are born, hope has been born; hope for the whole world, thanks to God’s faithful love.